Basic dashboard cameras are simple devices that are designed to automatically turn on and start recording when you turn the vehicle on on which it is mounted and wired. It captures video footage from a wide angle camera lens to give a good record of your road trip and does not require any user input except for its mounting and the installation of the TF or Micro SD card. Dashboard cams come in a variety of models, price ranges, and capabilities. The affordable, basic model is ideal for a car owner who wants to verify the usefulness of the device before investing in a better-quality model with greater capabilities. The ABLEGRID GS8000L Night Vision HD1080P is designed to provide crisp, HD 1080P videos from its 120-degree wide angle lens, with 4x digital zoom option when you want to focus on an image captured by the 2.7-inch LCD screen. The dash cam is shake-proof, which means you will get clear video even when passing through rough terrain or bumps on the road. It is equipped with a G-sensor that automatically locks the video file being produced when the vehicle undergoes sudden movements from heavy braking or collisions to preserve significant footage. The camera records videos to a TF card in a loop, overwriting the oldest videos with new ones when the memory is full. 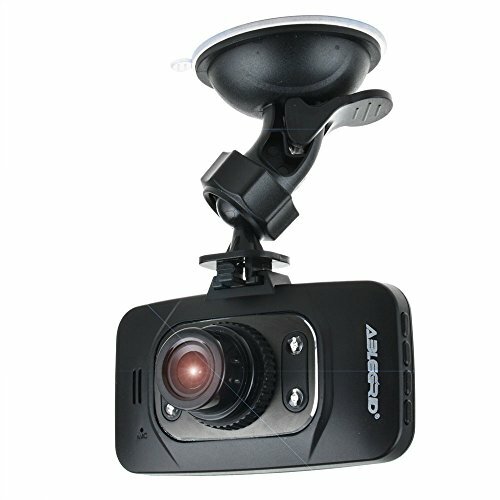 The ABLEGRID GS8000L Night Vision HD1080P with 120 Degree Wide Angle and G-Sensor is an easy to use, reliable dashboard cam that provides motorists with crisp video of their road trips, capturing clear and continuous images that can be transferred to a computer for reviewing or future reference. The videos are time stamped for convenient association with specific events encountered along the road – for example, accidents or unusual events. If you are looking for an affordable dash cam that will provide you with clear and continuous on-the-road video footage, then you can compare the ABLEGRID GS8000L Night Vision HD1080P with 120 Degree Wide Angle with the Digitsea 1080P HD Car DVR 2.7-inch TFT Screen and 140-degree Wide Angle Lens and the New 2.5-inch HD Vehicle DVR with LED/IR Road Dash Video Camera Recorder from Kimberly. These alternative choices have similar features and are also competitively-priced. If you are looking for a reliable dashboard cam that will provide you with crisp, continuous video, the ABLEGRID GS8000L Night Vision HD1080P with 120 Degree Wide Angle and G-Sensor is the best option. It can be plugged to the car charger for continuous recording, with an optional lithium battery when the device is used as an HD camera off the car. The G-sensor and anti-shake features ensure that video footage is clear and well-protected, even when the vehicle has become involved in a road accident. The Digitsea 1080P HD Car DVR 2.7-inch TFT Screen and 140-degree Wide Angle Lens is equipped with Motion Detection that protects video files taken during vehicle collisions from being erased or overwritten. The 140-degree wide angle lens gives a great field of view, while the 4x digital zoom gives the option to focus on certain details – for example, car license plates. The dash cam should be plugged into the car charger for continuous recording, though it comes with a lithium battery option that will last for about 30-minutes when fully charged. The camera accepts standard 32GB TF cards for saving files. The New 2.5-inch HD Vehicle DVR with LED/IR Road Dash Video Camera Recorder from Kimberly is designed for plugging into the car charger for continuous video recording of footage with a real time and date display. It provides options for video resolution settings of 1280×720, 848×480 and 640×480. The dash cam features a 90-degree viewing angle and a 2.5-inch TFT color monitor. It supports MicroSD cards of up to 32GB capacity. If you are looking for an affordably-priced dashboard camera that you can rely on to provide clear and crisp video wherever you take your car, the ABLEGRID GS8000L Night Vision HD1080P is the best option. The second best choice is the Digitsea 1080P HD Car DVR 2.7-inch TFT Screen and 140-degree Wide Angle Lens that gives a deeper viewing perspective with options to record in sepia, color or black and white. Finally, the New 2.5-inch HD Vehicle DVR with LED/IR Road Dash Video Camera Recorder from Kimberly is a good choice if you want a dash cam that supports high speed recording in variable resolutions.